As we all continue to hammer away at rep grinds, dailies and getting our item levels up, I want us to take the time to discuss two things for this post. First, I’ll give a rundown on our last level 90 talent known as Mannoroth’s Fury. The second thing I think we should address are concerns over numbers. Before I get to those two important topics please let me give you a quick rundown of what I’ve been doing in game since many of you have been asking in emails and with DMs on Twitter. I always get choked up at ceremonies! In fact, I’ve been having so much fun on my warlock that I’ve completely neglected both my hunter and shaman and sadly they both sit at level 85. For me, that says a lot. I plan to change that soon and start leveling them up as well, but I’ll have to blame Blizzard for this because I’m enjoying the love of my lock immensely! Taking my new mount out for our first flyover! I’ve run the heroics and not the raid or scenarios. Why only heroics? For raiding, I’m waiting for the rest of my raid team to catch up. Not all are quite at level 90 yet, but I’m sure in the next week or two almost all will be there. For scenarios, I plan to find a good team to go in there one night per week and go for the gold, or the silver I don’t care which really. I just think it’ll be fun running for the challenge and I don’t want to ruin them with a pug group, ha! I just know from my pug time in ZA / ZG that a bad pug can ruin your attitude towards something that should be fun. What about all of you? What are you liking or not liking about the expansion? Are you a pet battling fiend like my friends? What spec on your lock are you running? Currently, I’m running Affliction as my MS and Destro as OS. For our Demo brethren please don’t feel that I’m discounting it. Trust me, I know it’s fun too and I’ll probably run with it again at some point; however, I ran Demo mainly in beta so I’m giving it a rest for a few weeks. I think @eljeppy from CtrlAltWoW Podcast said it best when he told me he really liked Demo and said it felt like “Impmaggedon” when his imps proc and he has a screen full of them. I love that description, don’t you? Now, let’s get on with the good stuff! When your applause dies down, and your excitement tempers please keep in mind that while a 500% area increase for AoE sounds huge in the cryptic language of Blizzard’s spell descriptions, Mannoroth’s Fury is really only about a 145% increase when talented mathematicians compute out the numbers. Over at Wowhead on the Mannoroth’s Fury page, Alnair has a great write up on the subject in the discussions section. I’d recommend you give it a gander! 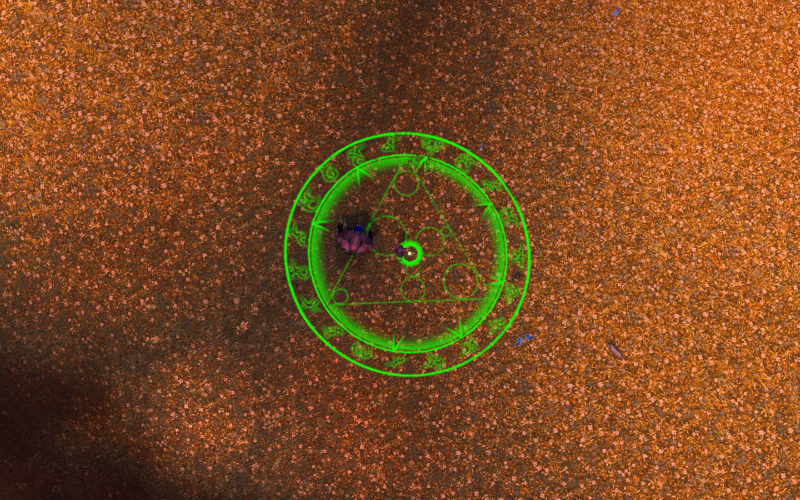 For example, as Alnair points out that a spell such as Shadowfury with an 8 yard range only increases to almost 20 yards. 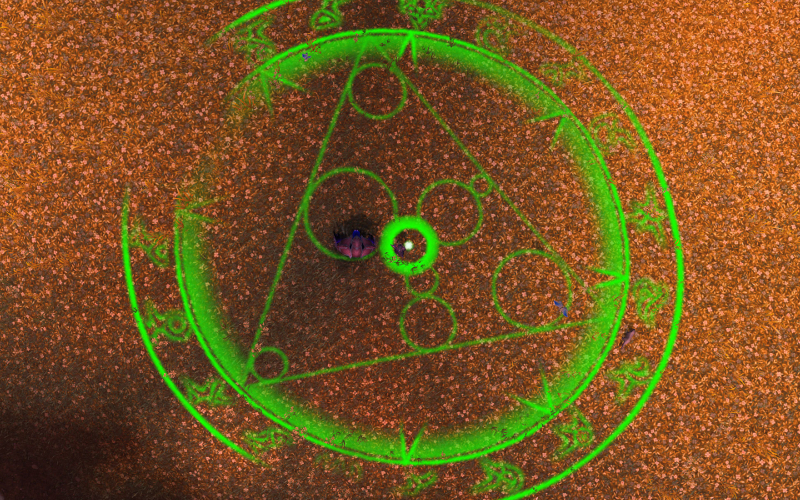 As you can already guess because you’re all smart and very bright (c’mon you chose a warlock so how could you not be?) Mannoroth’s Fury will be a great boon to fights where lots of trash needs to be burned down quickly. It’s pretty easy peasy right? You bet it is! Just please, for the love of all that’s Hellfire and Fel flame…please don’t overdo it! The last thing we want to do is aggro everything in site and have every tank in the game crying about hating to run with warlocks. That kind of play style doesn’t do any of us any good in any way what-so-over. So my advice is to never be that kind player! 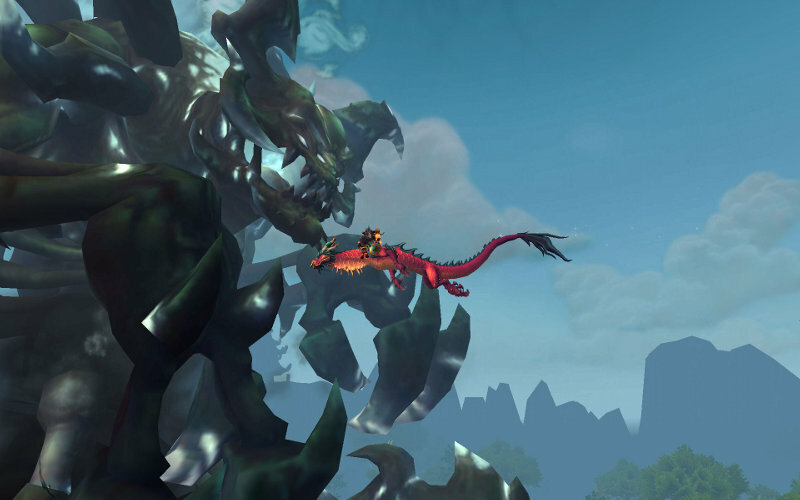 For any PvE (scenarios, dungeons, raids) make sure your tank has a good handle on what he plans to pull and where he plans to pull safely before you begin to light up the room making things go boom! I’m sure for PvPers the Mannoroth’s Fury Talent can mean delicious peril to your foes when capturing a flag, control point or helping your team to zerg the enemy when heavy, grouped fighting is needed! Bah! If only I had this in WSG and AB when there wasn’t a time limit! Yes I know, I really do need to make more time for PvP because this talent would make me cackle laugh so much my family would think I’d gone insane…well, I should say more insane. 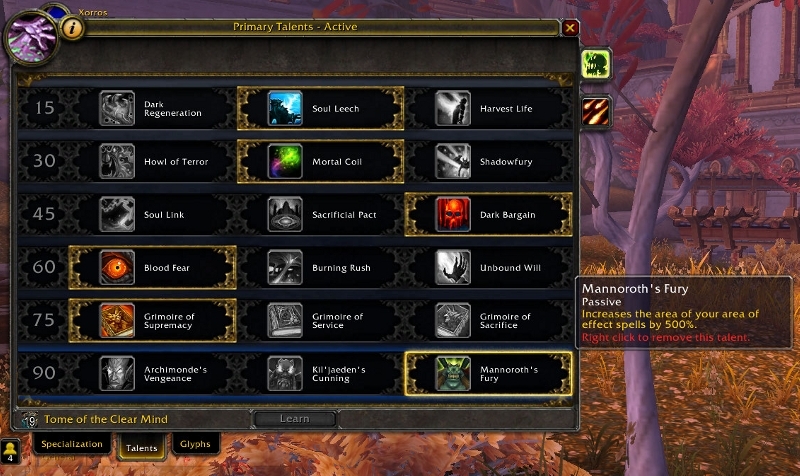 Mannoroth’s Fury is a good talent option to have, just remember for PvE to use it wisely and carefully. For PvP you should abuse mages it as much as possible and if a mage just so happens to be in the group your fighting against the better! As warlocks, we all strive to do the best dps that we can. That’s understandable and a great goal to strive towards. Sadly, I often watch as the recordings of the addon RECOUNT are tossed around like the be all and end all of a fight. The same goes with many sites that do number crunching and theory crafting. RECOUNT and these sites are great tools to use. Always keep them in the perspective of what they are…effective tools at analyzing information. Are resources like RECOUNT and theory crafting / SimC sites useful? Yes. Are they 100% accurate? Based on the numbers they use I’d say yes, but based on how the game is played I’d say no. Here’s some reasons for my opinion and why I think that despite all they math and theory you still have to put them into the context of live play. First, in any fight whether it’s PvE or PvP there’s always the human factor. I’ve never seen a fight go down exactly the same way, ever. Yes, the end result is usually that the boss dies and loot drops, but every single time something different and random always happens in between the pull and when a boss drops. I’ve seen tanks forget to pop a gcd, healers running out of mana because the raid didn’t move fast enough, too many mobs can get pulled, someone stood in the bad stuff and died, someone DC’d, heroism/bloodlust was popped too soon or too late, or a battle rez was still on gcd when it was needed and I could go on and on about how random things occur all the time. Another reason not to get too bent out of shape in regards to numbers is that they don’t take into consideration all of the nuances of the fight. Sometimes fights are melee friendly and range loses out! Sometimes it’s the reverse. Some fights are heal intensive. Sometimes fights tank intensive. Let’s not forget fights with lots of movement. Or how about fights with wide ranging crazy mechanics? I hope you see what I mean, and understand the point I’m trying to make in not worrying too much about numbers. Use them as a guide to strive to better your toon, but don’t let them get you down or make you consider playing a different spec. Blizzard giveth, and Blizzards taketh away. Patches occur quite often and the developers are always making tweaks here and there, buffing some and nerfing others. It’s going to happen and it’s not going to end so just expect it and move on. What one website said about the optimal dps four months ago might be off substantially by next patch if not already. Trust me, I’ve played a warlock a long time and ask any seasoned lock and they’ll talk about the great times and the bad. Brief moments of when we were on top looking like rock stars, and then the other times when we were nerfed to the ground. 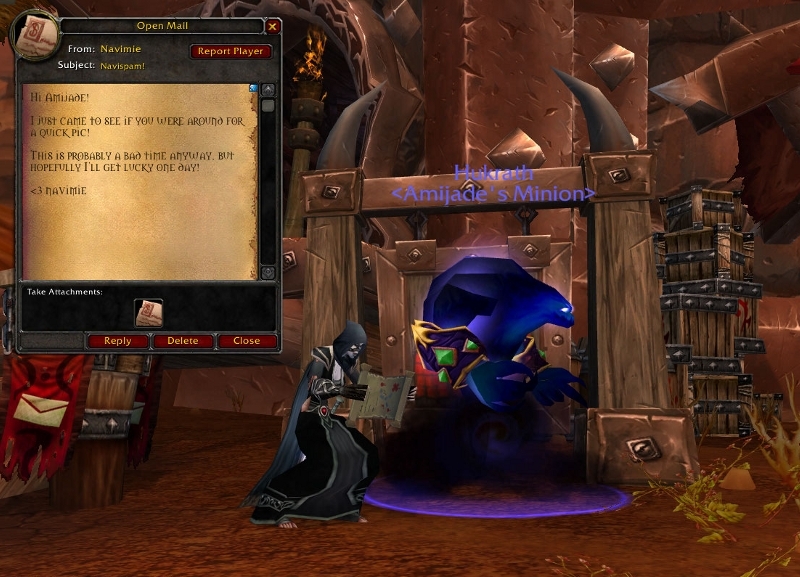 The same kinds of stories about “glory days” and the “rough times” can be told through the eyes of any class in Warcraft. Every class has these issues and not just our wonderful warlocks. I’m an old warlock. I’ve done a lot of things and I’ve seen a lot of things. I’ve made a lot of mistakes and I’ve learned a lot too. 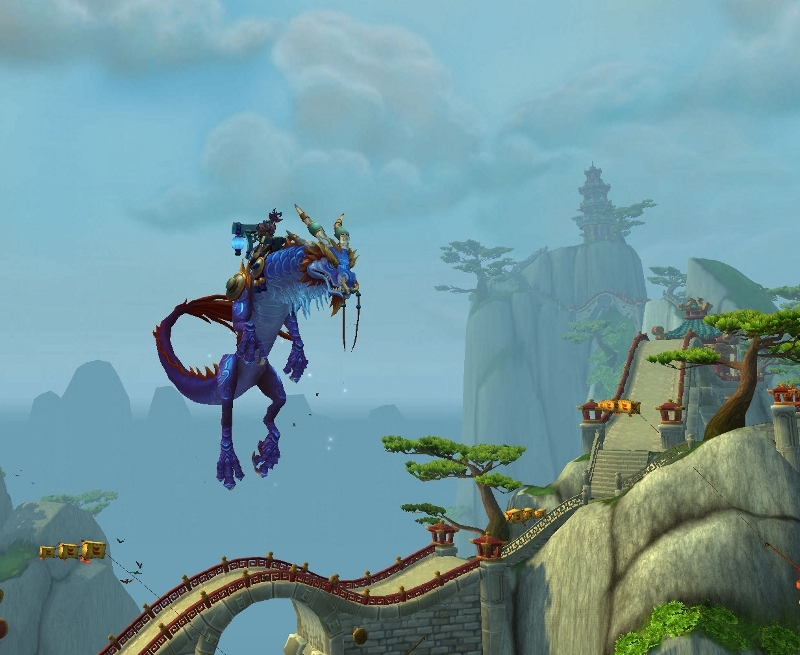 I’ve roamed and explored from the wild frontiers of vanilla WoW all the way to it’s amazing new continent of Pandaria and everything else in between. If there’s any advice I can ever give to another warlock that is of any value what-so-ever it all boils down to this: Have fun and don’t ever let static numbers dictate your enjoyment of playing the game or in being a good player. The numbers will and have always changed from highs to lows, from lows to highs, from class to class, and from spec to spec. The only thing that matters truly in the end is “Do you want to login?” and “Are you having fun?”. It’s your time, your money, and your toon so go out there and get your money’s worth! Sorry for the rant everyone, but I think this issue of “what’s hot” and “what’s not” needs to be addressed. I’m sure that you, like me, understand that many high end guilds fight for their spots in the rankings and take the game quite seriously when it comes to raiding. I wish nothing but the best to those folks and I salute them for their dedication and effort. It’s a lot of work to remain that dedicated and on the cutting edge of game play. However, most of us aren’t in the top 100 rankings and if I see another lower level warlock talking in guild chat or in trade chat telling everyone that they are switching from the spec they like play to a different spec that they dislike because they read somewhere that the spec they don’t like is doing the highest dps atm, I think I’m going to scream! Does anyone agree with me? Can I get a halelujah someone? I know I can’t be the only person that thinks this way! This pic has nothing to do with this post, but I thought I erased it by accident and I’m really happy that I found it! Ha! It still makes me smile! To add to your already wonderful point, changing to another spec for that “extra” dps doesn’t take into account how well you play your current spec. If you are a fantastic Affliction warlock but have never played Destro then switching for that extra 1% damage may not be in your best interest. Someone who has the muscle memory and EXPERIENCE with a spec will almost always be better in that spec than the current flavor of the month. Now if you are a robot (like some of my guildies) then this isn’t an issue, but for the “normal” people, this usually makes the difference. Thank you for the info on MF. I think I might be switching to it for my dailies. I have KC atm but I think this might be much more useful. You know, I think playing with Robots actually sounds like fun so I’m kind of jealous! Personally, I still run with KJC only because I love practicing movement when I can – It’s good practice for me with Affliction whereas MF is more of a set it and forget it kind of AoE enhancer. Now that I think about it, maybe I should have been running MF during the launch so that I could “mobsteal” with my AoE like I saw so many other players doing to me…Ugh, that drives me nutty! Well, I hate that and when a flying druid steals an herb node from me just as I reach it! Or a stinkin druid in travel form moving at 105% movement speed…gah I hate that bull…still the enhancer is a nice bonus, especially if you enjoy grinding with harvest life, just watching all that juicy damage spread makes me smile. I’ve always been skeptical about the full relevancy of a lot of theorycrafting, partly as a result of the stats training I got in college as a history major. :) Theorycrafting focuses on a kind of situation, and can be illuminating about it, but there’s so much else involved….and then people reading the results need to understand how it all works in real life. I see people online saying things like “Only a fool would go for X over Y because Y is 5% better!” And I think, “Really? Your connection speed will vary more than 5% with a lot of internet providers. Your computer’s internals will vary more than 5% based on time since last reboot, un-released memory, etc. Your reflexes will vary more than 5% based on blood sugar level, fatigue, environmental distractions. Your subconscious decision-making will vary more than 5% for a zillion reasons, including whether you’re enjoying the process and outcome.” It’s not that the in-isolation performance differences don’t exist, it’s that they get swamped in real life by considerations that people almost always underestimate – we are a species of mammalian animal often bad at judging our own performance, just like any animal that leaps for a branch on a nearby tree and misses this time despite having made it many times before. The other thing, of course, is that individual performance only goes so far in a group situation. Unless a change of spec and approach will move me from reliably being the lowest dps to something better, it’s almost certainly the case that I will not be the tipping point between overall success and failure in a raid, just one of the contributing elements. Nor am I ever in a race for realm firsts, let alone world firsts. Stuff that matters to the few dozen people at the top may not matter at all to me just lookin’ to get through things as best as me and my guildmates can while having a shared good time at it. Is a guildmate distracted by divorce proceedings? Celebrating a successfully completed move to a new home? Fighting off a flu? Happy about how the kids did in school this week? Thinking about how to vote in the next election? All of that can bear very directly on how we do, and no sim’s ever going to include it. So I look at the sim numbers, but then I go try things out anyway to see what works best for me as a player. Ha! Yep, it’s amazing what sticks in school and what doesn’t. Now…if I could only get all of those “Gilligan’s Island” reruns outta my head! One reason for it, at least if you are about equal at all the specs, is that you feel like you might be holding people back if you do not give it your best, and that to me personally at least includes spec switching, or even learning a spec from scratch (demonology in firelands for me for an example). Another reasons to switch specs might be if a hard fight heavily favours one spec over another. However that’s a matter of personal preference. For me personally it’s a part of the game that I enjoy, even if I dislike the current “best” spec, both theorycrafting and just in general trying to play as well as I can. I also think that one reason that there might be much discussion between warlocks is that as of now affliction has higher theoretical dps, and also seems to have higher real world dps than the other 2 specs. And some do not like affliction, but feel like they are forced to play it because it’s the better spec, and everyone does not like affliction (I for one absolutely love the spec as it is right now). And on top of that the gulf seems pretty large between the specs at the time being, so I do really hope for some balancing between them. However it’s still early in the expansion, so a lot of things can and will happen. I have to disagree on the distance between the specs atm at least from an Affliction / Destro comparison. I’ve run on both of them and my numbers are pretty darn close in numbers. Where I find Affliction pulling ahead is when I get a lot of Haunt procs on a tank and spank style fight. For movement heavy and AoE heavy fights, it varies on how many embers I have to burn as well too. Like you, I’m all about flexibility and I love the new swap-on-the-go talent system. I think I’m mainly lamenting for two reasons. 2.) I also don’t like when people follow the crowd for fear of being made fun of because the min/max’ers tell them they are doing it wrong. I’m glad you took the time to comment though, and for some reason I think this discussion will probably continue into the future for some time don’t you think? I agree on both those points. One shouldn’t feel forced to play a spec over another, especially (as has been said in multiple places, including comments here) as you usually do more damage in the spec that you know the best. And what Elanas says is also very true. Speaking about min/maxing, I’m a min/maxer, but I do not expect others to switch specs, neither do I make fun of people that do not play the way I play. It’s just that for me min/maxing is one of the parts of the game that I myself enjoy, even if it isn’t necessary (very rarely is). What I stated in my earlier post is my personal opinion, and is not intended to be applied to others. And yes, the discussion about best/worst spec/class/race/reforges/glyph/whatever (no matter if it’s necessary or not) will likely continue until quite a while after WoW stops existing. That’s a good attitude to have and I think you’re correct in your thinking as well! Friend: What spec are you running now? Friend: I hear Affliction is the top dog in DPS right now. Dak: Good for Affliction, I’m still playing Destro. It’s what I do. In my opinion play what you want to play and don’t worry about the numbers. Now that is a convo I hope more people are having! Burn it up my friend! Burn – it – up!